Egypt is a fascinating country that is rich in history. It links northeast Africa with the Middle East and dates back to the time of the pharaohs. Cairo is the capital and is home to landmarks such as the Muhammad Ali Mosque and the Egyptian museum, a treasure trove of antiquities. Thousands of year-old monuments including Giza’s Pyramids and the Great Sphinx are the star attractions as well as Luxor’s Karnak Temple and the Valley of the Kings tombs. A trip to Egypt is like walking deep into history. Here is a travel guide to some of Egypt’s top destinations. 1. Pyramids of Giza and the Sphinx – No trip to Egypt is complete without visiting the Pyramids of Giza. Did you know there are 120 pyramids in Egypt? But the ones around Giza are the oldest and the largest. One of the most fun things to do when in Giza is to ride a camel around the pyramids. You can enter the pyramids with a ticket and climb inside the Pyramid of Kofu. I loved seeing the inside of the pyramid even though it can be claustrophobic, steep and very hot. Know that there isn’t much to see, except an empty coffin. Driving down a little further into the into the valley but within the same Giza complex is the famous Sphinx. This ancient monument puts on a sound and light show every evening as well. Tip: watch out for the street vendors hanging around the pyramids, you can avoid them by not making eye contact but if you do want to buy something remember to haggle. 2. Valley of the Kings – The Egyptians are famous for their elaborate burial practices of the Pharaohs. Tutankhamun and Ramses II, the two most prominent Pharaohs from the New Kingdom were buried in the Valley of Kings on the west bank of Luxor. Climbing into the shafts to see the tombs gave me goosebumps as it’s like climbing deep into history itself. Seeing those reliefs and murals from 4,500 years ago is a sight not to be missed. Tip: Get a local guide to visit these tombs as the texts and depictions are quite complex and for me, having a guide explain the history and meaning is more interesting than simply doing a walk through. The ticket allows you to get into three tombs but the tombs of Ramsesses VI and Tutankhamun require separate tickets. 3. Temple of Philae – This temple is dedicated to the goddess of Isis and is located on a small island a few kilometers in front of the grand Aswan High Dam. Temple of Philae is one of the most well-preserved temples in Egypt. It may very well also be the site where the last hydrographs were written. Tip: Check out the sound and light show in the evenings if you want to see the temple by night. 4. Abu Simbel – I took a one hour flight from Aswan to Abu Simbel and a 15 minute taxi ride from the airport to see the rock temple of Ramses II – a little hard to reach in Egypt but so magical and worth it. You can also take the bus or taxi which takes about three to four hours each way. A UNESCO site, it was built by Ramesses II to celebrate his victory over the Hittites in the battle of Kadesh. The temple was built into the rock in between the 13th century B.C. 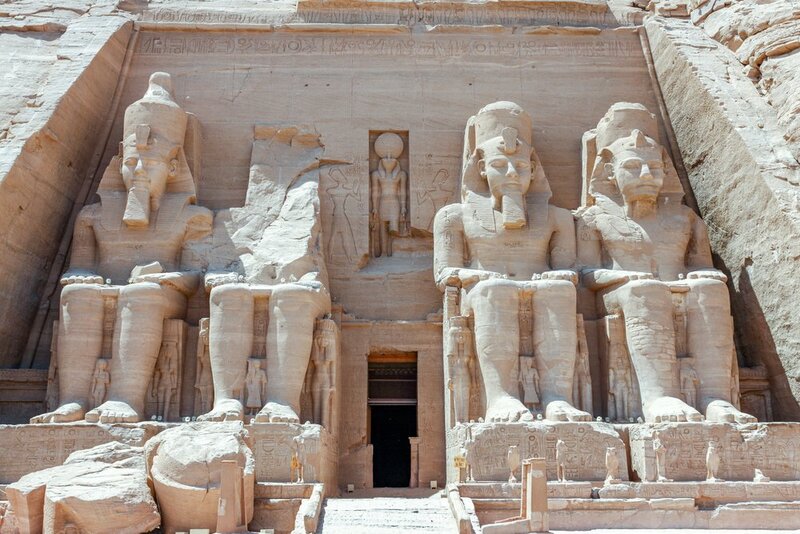 Four colossal statues of Ramesses II guard the entrance to the temple. The murals inside depict Ramesses battle prowess and the line of statues of Ramesses II (20 meters high), inside the sanctuary will take your breath away. 5. Snorkeling in the Red Sea – When one thinks of Egypt, I’m not sure snorkeling is top of mind but Egypt has some hotspots like Sharm-el-Sheikh, and Hurghada. These places boast the colorful maritime life of the Red Sea and the resorts in these areas are luxurious yet not that expensive. 6. Karnak Temple in Luxor – This temple dates from around 2055 BC to around 100 AD and dedicated to the Theban traid of Amun, Mut, and Khonsu. It is a city of temples really, built over 2000 years and is the largest religious building ever made. The Hypostyle hall, at 54,000 sqft and with 134 columns is still the largest room of any religious building in the world. Apart from the main sanctuary, there are many smaller temples and a large lake. The ancient Egyptians believed that the gods and the earth become exhausted at the end of every annual agricultural cycle and that they required fresh energy from the energy of the cosmos. To facilitate this, the Opet festival was held annually at Karnak and Luxor. It used to last for twenty-seven days, where the procession began at Karnak and ended at Luxor Temple. 7. Cairo Citadel – The Cairo Citadel houses a number of museums, mosques and sites and is one of the world’s greatest monuments to medieval warfare. It is also a monument which is very visible on Cairo’s eastern skyline. Viewed from the back, the Citadel is very medieval in character. A popular monument, it is today one of the few non-pharaonic monuments in Egypt. 8. Egyptian Museum Cairo – A visit to this museum is one of the highlights of visiting Cairo. It is home to 120,000 Egyptian artifacts, warranting at least one or two full days at the museum. There is an entire section of the museum that is dedicated to Tutankhamen, the famous boy king. His tomb is one of the few tombs of pharaohs that was fairly intact when discovered. The museum also has an amazing jewelry display and the most interesting fact is that the items displayed have all been worn by people who lived thousands of years ago. The museum also has enough sculptures to keep you busy and the Royal Mummy Room today has 11 mummies, including the most recent discovery, that of Hatshepsut. Getting to the museum early in the day is recommended as it is one of Cairo’s busiest and most popular tourist attractions. 9. 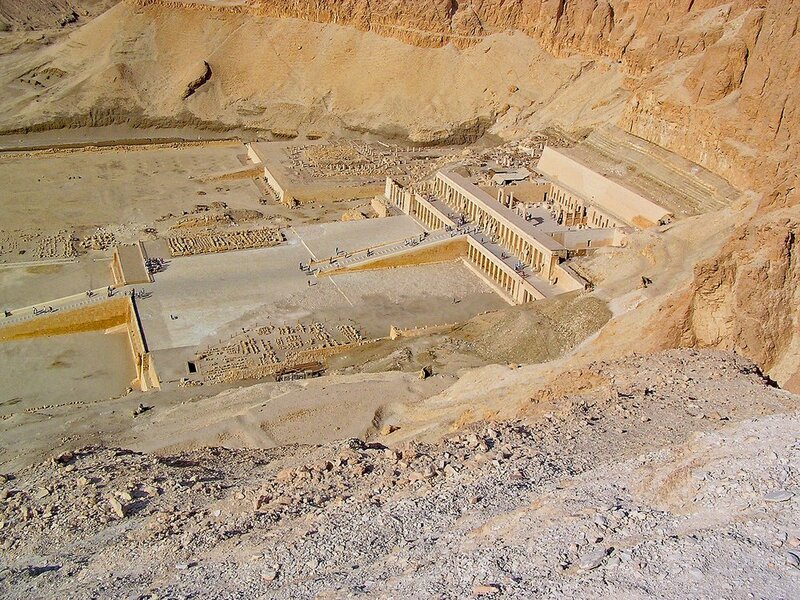 Hatchepsut Temple – Beyond the Valley of the Kings, lies a mortuary temple dedicated to the female Pharoah, Hatchepsut. It is one of the popular sights in Egypt and the entrance is stunning. There are also some famous murals featured inside (like Hatshepsut’s expedition to the kingdom of Punt). 10. Luxor Temple – This temple, built by the New Kingdom pharaohs, Amenhotep III and Ramses II is a stunning monument that is located in Luxor town. Early hours are the best time to visit this temple but seeing the stones glow at sunset is magical. At night when the temple is lit up, it’s interesting to see the light and shadows created by the reliefs and colonnades. In ancient times the temple was surrounded by mud-brick houses, shops and workshops, which are now under the modern town. After the city declined, people moved into the temple complex and built their own city within this complex. There is also a mosque that is visible in the interior courts, built for the local sheikh. In front of the temple is the Avenue of Sphinxes that ran all the way to the Karnak temples 3km to the north.